This FRONT LINE APARTMENT (NB. THIS SUPER APARTMENT IS FOR SALE DUE TO MEDICAL REASONS PLEASE CONTACT BRIDGET AT BLACK LION PROPERTY SERVICES KALKAN 0090(0)5324404112) is on the first floor, with a large 13ft balcony, west facing, having uninterrupted views across the bay and out to sea, with views over Snake & Mouse Islands. It comes with a fully equipped bathroom, kitchen, living room, balcony and full air-conditioning. There are five shared swimming pool set in a garden of olive and palm trees. The property is now FULLY WiFI'ed !!!!!!! THE APARTMENT HAS NOW BEEN RE-EQUIPPED AND RENOVATED (NOVEMBER 2015) FOR THE 2016 SEASON, THIS INCLUDES A NEW BATHROOM, HAVING HAD THE BATH REMOVED AND REPLACED WITH A NEW GLASS WALK IN SHOWER SYSTEM WE LOVE IT AND HOPE THAT YOU WILL TOO!! This apartment occupies what is arguably the very best position in Kalkan, having a quiet location, yet within 5 minutes walk of the main streets, shops and restaurants, harbour and 7 Beach Clubs. No need for expensive TAXIS every night to get back to your villa half way up a mountain!! We provide swimming pool sun loungers. The apartment is in the Ortaalan area (central) of Kalkan. Honestly you do not need to take masses of baggage, because you really do not need much, and anything you forgot can be bought locally anyway, so don't waste money paying airlines for baggage you just do not need? WARNING - PLEASE BE AWARE THAT YOU NOW NEED TO OBTAIN YOUR TURKISH VISA ON LINE AS YOU CANNOT NOW GET YOUR VISA ON ARRIVAL AT AIRPORT YOU NEED TO GO TO THIS OF COURSE DEPENDS ON WHICH PASSPORT YOU HOLD BUT BEFORE YOU CAN ENTER TURKEY YOU NEED TO LOOK AT THIS! PLEASE MAKE SURE YOU GET YOUR ENTRY AND EXIT DATES CORRECT. VISAS ARE ISSUED ON MULTIPLE RE-ENTRY BASIS VALID 90 DAYS IN ANY 180 DAYS. WE WILL ADVISE BUT IT IS YOUR RESPONSIBILITY TO ENSURE THAT YOU HAVE A VALID ENTRY VISA. If you are not sure please ask and we will clarify!. Note: From January 2018 we understand that the Turkish Government will now impose a tax (VAT) on all rental properties this being 18%. if this turns out to be the case all clients wil lhave to pay this tax in addition to the booking fee already paid. We are sorry about this situation but it is not under our control, and it applies to ALL bookings on ALL properties anywhere in Turkey. This is in addition to the £20 charge (payable locally) for the GIYKIMBIL Jandama personal registration in Ankara for all people renting properties in Turkey. Gecic Yarlesim Kimilik Bildirim Sistemi. This under the Regulations presently in force which also require clients to suplly copies of their passports in advance. This is the law and w must comply. Historic Sites Nearby: It is within easy reach of Myra, Pinara, Tlos, Xanthos, Letoon, Patara, the Saklikent Gorge, and Kekova. You travel to Kalkan via either Dalaman or Antalya airports, and then by private air-conditioned transfer (90 mins). When you are in Kalkan you can spend the day on the pebble beach, sit by the pool, or visit the beach club. If however you are feeling energetic you can arrange a jeep safari, a boat trip on one of Turkey's famous Gulets, go diving or fishing, perhaps trekking, sailing or paragliding. Jeep safari's are a must! Within walking distance of the apartment you will find 'Indigo Beach Club' on the right side of the harbour, also you have the 'Yali Beach Club' and almost next to that you have the 'Caletta Caletta Beach club' So you are not short of choice?? If you go to the left side of the Harbour you will find the Kleo Bar next to the Kalkan Town Beach! From this end of the Harbour you can get a FREE BOAT across the bay to the 'Patara Prince Beach Club.'! Plus 2 others. Other Things To Do: You could of course spend the day at one of the 4 Turkish baths, or visit one of the many Turkish Barbers, or just go shopping in one of the Old Towns' many shops. Sit and have a drink in the harbour and watch the boats come in! Spend the evening eating and drinking in one of the many super restaurants or cafes. There are variety of bars, some having blues / jazz or belly dancing. You could of course arrange a moonlight boat trip with dinner on board. The South West Aegean and Mediterranean coast of Turkey has now become the holiday destination of choice for Europeans. This is not only because the people are so friendly, the food is so good, and because Turkey has a fantastic climate (Season March through November) but also it is very secure and safe. Oh and did we mention that you get really good value for money? Turkey not only provides super beach and activity holidays but also a wealth of archaeological sites from the Lycians to Byzantine, Roman and Greek ruins. We also advise that you do NOT change money on the way in at Dalaman Airport as the rates are NOT good, we suggest you change money in Kalkan. The Post office (PTT) on the main street usually has good rates. (Open till Midnight) Most people in Kalkan and even on way (if you stop for a beer etc) will take Sterling. There are 5 or six banks in Kalkan now all with ABM's. / hole in the wall - bankomats! PLEASE BE AWARE THAT AIRPORT TRANSFER SYSTEMS WILL COLLECT YOU 4 HOURS BEFORE DEPARTURE AS YOU NEED TO BE AT AIRPORT 2 HOURS BEFORE YOUR FLIGHT ! Please make sure that you have full travel insurance that covers you for missed flights and your airline going bust ! We cannot accept responsibility in any way shape or form for accident / injury / missed flights/toothache etc however caused. Our management staff are always at your disposal 24/7. toilet, shower, bidet, Newly Renovated! The bathroom, like the rest of the apartment, is fully equipped and has a bidet Turkish style installed in the toilet. We have for 2016 installed a walk in glass shower unit. (please like all of Turkey and Greece DO NOT put anything down the loo including used toilet paper for which a separate bin is provided.) The bathroom floor is now fitted with non- slip tiles for your safety !!!! Full aircons bedroom & living area. American size big as you can get in turkey. You can store everything in the fridge and the big freezer. Fully equipped with full oven 4 ring hob. Breakfast on your balcony overlooking the bay. This complex is known as the garden apartments. Beautiful flowers and palm trees. Yes you have 5 swimming pools to choose from depending how energetic you feel. You have 5 swimming pools to choose from, all being different shapes, all set in beautiful gardens with views across the bay. There is also a beach and 7 beach clubs! All walking distance. You have 2 other super beaches a short trip away including the famous 18 Kms of Patara Beach which is Blue flagged and the breeding ground for sea turtles! A must to visit! So much to see and so little time. We suggest a minimum stay of 14 days. This just to give you time to chill out! OUR RECOMMENDED TRAVEL AGENT IS: BAR JOHNSON TRAVEL Tel:: 01943-605526 ATOL/ ABTA bar@barjohnsontravel.co.uk OUR RECOMMENDED TOUR OPERATOR for trips and driver / car hire etc is OZ at DEFINE TOURS in the harbour - details in the apartment. Our recommended restaurant is TRIO & Moussaka in the harbour Our recommended bar in the harbour is KLEO BAR ask for Durali Best for breakfast and serious Turkish music nights, good home cooking, and a drink anytime is your local just behind you CHILLIES , and The Blue Turtle! We've stayed in the Mediterranean Apartments a few times but it was the first time in K2 - a lovely apartment, nicely maintained/renovated, plenty of wardrobe space, and a good location within the complex. Would definitely recommend. Very pleased that you had a great holiday and you enjoyed the apartment. We hope to see you there again very soon.........? A pleasantly appointed apartment with delightful view. Set in a nice complex which seemed to be well maintained and clean. The swimming pools had apparently been renovated earlier in the season and were all superb. A previous review mentioned that the bathroom needed attention, this has been done and it is now a good shower room. The bed was very comfortable and the sitting area and balcony well appointed. We asked for some basic food items to be in place because of our late evening arrival and this was all in place when we arrived. The only very small criticisms we have are that a towel rail in the bathroom would be useful there is even space for a freestanding one. An extra teatowel, there was only one provided. The guest information stated that the apartment would be given a clean whilst we were there this did not happen. However overall we were very pleased with the apartment and had a lovely holiday. We are pleased that you liked the apartment with the new bathroom, and hope that you enjoyed Kalkan and it's many restaurants, although you failed to mention anything about Kalkan or places that you visited during your holiday. Where you happy with the Wi-Fi system? We provided you Free of charge a Turkish mobile phone in order for you to book your interim clean with our management team, but apparently you failed to do so, they presumed you wished to be left alone!!! Some people do! Anyway we understand that you had a good holiday. Pleased you did and we hope to see you again in sunny Kalkan. WHAT A GEM IN THE SUN! Stayed here for a delightful two weeks in the sun, went swimming every day used 2 pools and once in the sea at Indigo beach club. Both pools and sea were really warm having had the sun all year. Apartment was just super, what a little gem! The location is really fantastic and quiet. Just behind you have the Blue Turtle which is fab for live music ideal for drinks after dinner. Above that is Chillies great for lunch and dinner try the Adana kebab - spicy. 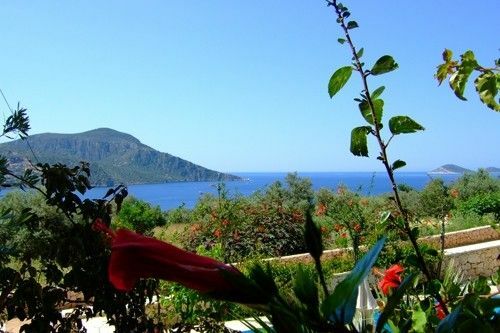 Great apartment lovely location and Kalkan must be the prettiest little town on the coast? Just love the place wish I was here for Xmas. We will see next year very pleased you liked the blue turtle . We recommend K2 for a great stay in a fine location, however from the description of K2 we had expected something 'SUPER' but this is an exaggeration with, ’TIRED’ being appropriate. Other apartments were nicely updated. The bath is chipped with penetrating mould in the grouting, ineffective (flooding) very basic shower curtain & tricky WC bidet tap. The toaster is battered, lack of tablespoons, no oven glove and risk of hand burns. One of the cooker hob rings was out of order. Furniture is of fair quality, although the comfy bed advertised as ‘especially made in Istanbul’ was nothing extraordinary or larger than might be expected and the sofa bed was grubby. Bedding sheets were undersized but this was fixed later in our stay. The WiFi and air conditioning was excellent. No sun loungers for the balcony, unless using the flat mattresses used on the pool loungers. Placing mattresses on it would require moving the heavy balcony furniture inside. The closest pool is properly maintained and keeps the sun all day but the surrounding area becomes shady around mid-afternoon. The lounging area was tight on space when busy and it is difficult to move lounger and parasol kit to other pools due to steps. Ozgur and his wife Ozge are attentive property managers who keep the apartment well supplied and spotlessly clean. Breakfast pastries and afternoon cake were a nice touch. Define Tours transfer inbound had a careful driver; return driver was dangerous and scary. Kalkan – right on your doorstep, but not noisy! Great weather and so much to see and do. Try 'Chillies' for breakfast after visiting the Thursday market, also great for evening meals. Other restaurants include ‘Authentic’ roof terrace, sea bream at fair prices, ‘Alternatif’ for fabulous fillet steak at tiny prices, The Olive Garden top roof terrace has perhaps the most splendid views of Kalkan by night, amazing food and excellent wines. Gulet boat trips. The gorgeous Yildiz 2 is our first choice at 70 TRY for a full day with a great lunch, also BBQ cruise under the Milky Way stars. Kartal boat for a great day private hire with friends. Kalkan Beach Park club is just across the bay for a good day out. Yusef the tailor opposite ‘The Olive Garden’ for handmade dresses and shirts etc. Quality ‘designer’ style handbags at very fair prices from ‘Misty May’ in narrow street by the far end of the harbour. See you in Kalkan next year? Firstly I am much appreciated of your various comments and am aware of the same, but am pleased that you had a really good holiday and enjoyed your time in Kalkan. Obviously you managed to find some good restaurants and some good boat trips. All my clients seem to love the "Olive Garden" but in 10 years I have never managed to go there because at the time of year I go it is always closed. Lucky you! Let's face it many people book a holiday in Kalkan and find themselves half way up a mountain, which maybe ok if you are fit early evening on the way into town, but it's a big problem after midnight and a few raki's trying to get home. You have to admit that it's worth a lot to be on the level (almost) and 5 mins walking from the centre and still very quiet?? Probably my fault but we have specially sun loungers for the balcony which actually are stored under the bed which lifts up on a hydrolic system. It's a bit something the Brits are not used to, but very Turkish. As to " tired apartment" I much apologise but i have schedualed a complete refurbishment as of this winter (jan/feb) unfortuntly this has not been done sooner as we have to close the apartment totally for 3 months and have been so booked this has been impossible. Many thanks for your visit and yes I do hope to see you next year? Just got back ,what a brilliant location, everything you need for a relaxing break.Apartment could not be faulted thanks Andrew for this, to arrive late at night to find a starter kit ,bread,butter soft drinks and even beer in the fridge was a nice touch. Oz and his lovely wife ,who dropped in every couple of days with treats from the local bakery again unexpected but appreciated. Hope all goes well for the arrival of their second child. Choice of restaurants amazing,Coriander,Old Trading House, Olive Garden really good,if you want away from chicken & steak try the pizzas at Kaptans just up behind,Chillies as well . Avoid the NAR unless you want half cooked chicken. Very pleased you enjoyed Kalkan! Hope to see you again? Booked and stayed for a month, great location but very tired apartment, many others to choose from in the Med apartments complex ideal location, 1st visit to Kalkan and we have learnt a lesson on prices and standards. WiFi was not in apartment when we arrived but stated in description, installed 2 days later so disruption to our stay. Sun loungers and mattresses broken on arrival had to wait for them to be replaced more disruption. Bed really badly stained on both sides also mattress protector, protector was replaced with new one, all these things should have been done before our arrival as owner gave it a great write up with many untruths, we were very disappointed. We were invited to have a look at many other apartments which were beautiful compared to what we had, also the rental cost was above these others which offered far more comforts and cared for interiors. Sorry to say that although the apartment is in a superb location it lacks appeal and is grossly over priced and we would defiantly not return to this apartment as we now know there are many more of a higher standard with a reasonable rental prices. I have many true pictures but am unable to add to review. I feel that this review is unjustified. Our managing agents in Kalkan tried their utmust to assist the clients regards in all respects as fast as Turkish time allows, but were obstructed by the clients themselves! We did issue new sunbeds and all other items including full WiFi to the apartment, (although this was not promised at the time on our website), Only local and Turkcell dongle! If there were any cleaning issues these should have been brought to the attention of our agents in - situ at the time and not brought to our attention after staying in the apartment for 1 month? In thought there is always one every 2 or 3 years with a complaint but this should not include broken sunbeds in the storage are which were not for their use anyway. Balcony sunbeds are available and stored under the bed, and they do fit on which is a 14 foot balcony as I use them myself all the time.. However I am pleased the client appreciated the location and position in Kalkan, but find it difficult to understand why having a new wifi in place they did not come thru to me direct immediatly, as we have 5 sets of everything in the private wardrobes for the cleaners to replace items as and when required. Kalkan is a historic town situated on Turkey's gorgeous Lycian Turquoise Coast, once a sleepy fishing village, Kalkan today is quietly sophisticated, yet is still extremely picture postcard pretty! With a multitude of upmarket restaurants with rooftop views over the small harbour and 'Snake & Mouse Islands' it has become known as 'The Beverly Hills of the Eastern Mediterranean'. Kalkan sits under the spectacular backdrop of the Taurus mountains and gazes out to sea over the bay to the endless shimmering turquoise waters of the Eastern Mediterranean. KALKAN WHERE THE STARS ARE NEAREST! Quoted in the Travel pages of the SUNDAY TIMES as having one of the ''10 BEST VIEWS IN THE WORLD''. NB. A booking for Christmas and New year is flexable so please call 07799038814 before booking on line. If you are arriving at a funny time we can arrange a welcome pack. TURKISH RENTAL TAXES ARE INCLUDED IN YOUR PRICE BUT NOT KVA. CREDIT CARDS PREFERED. !.